All stories are connected to Michigan. Each true account is thoroughly researched and share the bizarre, dark and sometimes unsettling paranormal stories of people and events that will take the reader from Michigan's distant past to the present. There are a couple of paranormal investigations covered but most stories focus on past events that defy logic. ... An Eloise Psychiatric Hospital patient and his sudden descent into a world of night terrors. Were his growing visions his mental condition or something else? .. An account of Michigan's most feared witch. ... A early 1900's spirit painter who claimed the spirits guided her hand as she painted American's future. Her final painting foretold a dark future with a uncanny ring of truth today. ... The story of a direct voice medium who rose to prominence in the Spiritualist Era. She could bring forward the actual voice of the spirit and said to be either the created medium of all time or the greatest magicians. .. A lost spirit child wandering Mackinac Island. ... An unsolved murder that takes us to northwestern Lower Michigan community and the spirit that may still wander. ... A dreadful late- 1800's murder on a land said to be cursed near Washington/Romeo. ... An investigation in a northern Macomb County community and the most unsettling poltergeist cases Bev and Kat ever encountered. When you call to the spirits of the dead, you never know what will come back. NOTE: This is the newest book by the authors, released in the spring of 2018. Kat and her sister, Bev, began the concept and writing of Stepping Into Darkness back early in 2013. 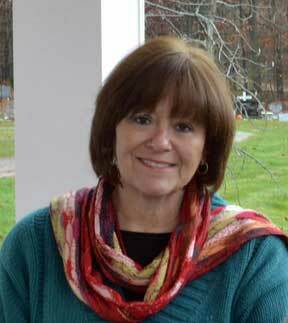 Unfortunately, Bev lost her battle with cancer before the book was complete. Kat picked up the baton and finished it. This represents the final, joint writing of the paranormal sisters. 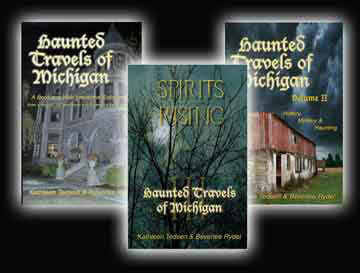 The Haunted Travels of Michigan book series consists of three books. Over a period of 10 years (2005 to 2015), Bev Rydel and Kat Tedsen traveled the State of Michigan. Sometimes traveling 10,000 miles per year in the state just researching and investigation reports of unexplained phenomena. During that time, Kat and Bev investigated hundreds of location. The Haunted Travels of Michigan Series represents 36 of the authors' most compelling cases of hauntings and the unexplained in Michigan. 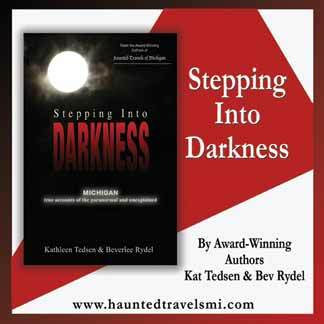 Each story is thoroughly research and presents considerable history and will then take the reader on a ghost hunt with the authors as they investigate Michigan's most haunted locations. NOTE: All stories represent public locations. All stories are WEB-INTERACTIVE. The book provides codes that will allow the reader to go the "Secret Rooms" of this website and see/hear evidence recorded during the investigation.